1CLICK | Screen Share during live calls. Our Screen Sharing Collaboration tool allows 2- way Screen Sharing such that the Agent as well as the Customer can Share Screens with each other. In the event of a Customer facing an error, he can easily Share his screen with you for diagnosis. 1CLICK’s Live Customer Support Tool has Google Chrome and Mozilla Firefox approved plugins that require to be downloaded just once for seamless usage of our Screen Sharing Collaboration Tool. The shared screen is visible on all browsers and downloading the screen sharing plugin is a prerequisite for the agent before entering calls with his customers. During a call with the customer, the plugin automatically downloads when the customer clicks on the Screen Sharing button. 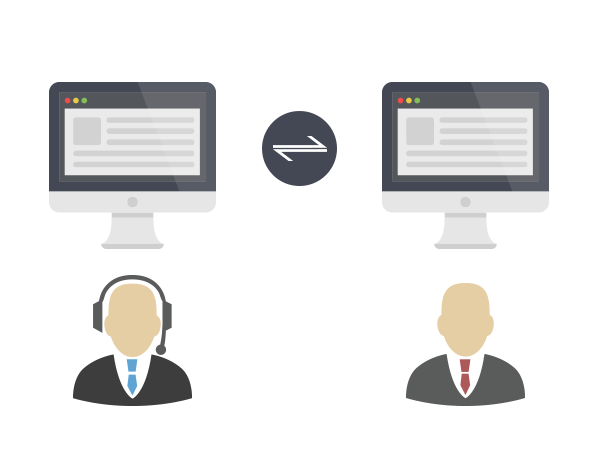 The Screen Sharing Collaboration Tool with 1CLICK’s Live Customer Support Software is a free package available to all our users during calls. It is activated on Sign-up and does not require any separate activation codes or account upgrades. Like our Screen Sharing Feature?